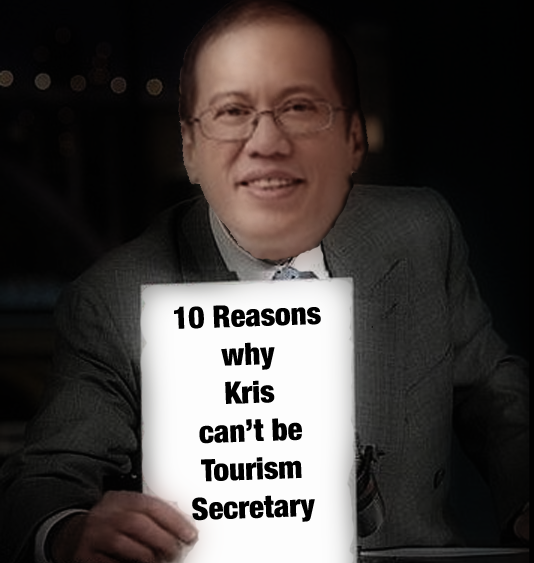 Why Kris can’t be Tourism Secretary… – CHUBIBO! I had a color-coded (yellow-tinged) dream last night. I dreamt that PNoy was Dave Letterman. 10. One ampaw uncle in POC is one kamag-anak too many. 9. Being tourism head and, simultaneously, its TV endorser smacks of conflict of interest. 8. A new source of advice – added to the Balay and Samar factions – will just confuse presidential decisions further. 7. She is not that interested to see foreigners touring the country; she’d rather give a tour of her heart to some Prince Charming. 6. Press briefings on tourism matters might be sidetracked and dominated by questions on whether she recently had breast augmentation. 5. Her tapings for “Deal or No Deal” will keep her pretty busy for the next few months. 4. Bimby can earn in one day what the tourism secretary makes in one year. 3. No budget allocation for bidets in every public toilet. 2. The position entails travelling around the country and some malicious minds might misconstrue this to be part of the plan for her to win a senatorial or gubernatorial seat in 2013, and… the presidency in 2016. 1. The President of the nation should not multi-task as the yaya of two frisky, growing boys.